Read on to learn the answers to some of the most frequently asked questions about Invisalign®. Invisalign® is a dental treatment that straightens teeth over a period of time. Invisalign® uses customized clear trays that are fitted to your teeth. Every two weeks, you switch to a new set of alignment trays to bring your teeth gradually closer into alignment. The trays apply a controlled force that slowly shifts the teeth until they are eventually straight and aligned. How can Invisalign® improve my smile? Invisalign® straightens crooked and overcrowded teeth, closes gaps, corrects bite abnormalities, and creates an even, straight smile. It does so with a nearly invisible treatment process over time. How is Invisalign® better than braces? Invisalign® trays are more aesthetically appealing than braces because they are virtually invisible. They are also removable, which makes eating and dental hygiene much easier and less restricting compared to braces. The trays are comfortable and smooth, unlike braces that have metal wires and brackets that can irritate your mouth. This treatment also requires less time in the dentist’s chair for adjustments and fewer office visits. Invisalign® trays cause only minor discomfort that is to be expected with moving teeth. This discomfort is more of a feeling of pressure than pain and can typically be felt during the first few days of each new set of trays. What age do I have to be to get Invisalign®? Invisalign® can be used when all baby teeth have been lost. Patients must also be disciplined enough to wear the trays for 20 to 22 hours per day. Depending on physical and emotional maturity, Invisalign® candidates could be as young as 12 or 13. What can I eat with Invisalign®? Since you remove the trays for eating, you can eat anything you like with Invisalign®. Always remove the trays when eating meals or snacks. What can I drink with Invisalign®? You can drink anything you like with Invisalign®. Be sure to clean your teeth and aligners soon after consuming sugary drinks so as not to trap sugar between them and damage your teeth. What is Invisalign® made of? Invisalign® trays are made of a clear thermoplastic material that is BPA-free. Invisalign® trays are clear and custom-made for you, which means they are molded to fit precisely over your teeth. As such, they are virtually invisible. Is Invisalign® good for your teeth? Invisalign® allows you to achieve straight teeth and maintain optimal oral hygiene through the treatment process. Having straight teeth promotes better dental hygiene, helps prevent tooth decay and plaque buildup, and improves speech and eating function. 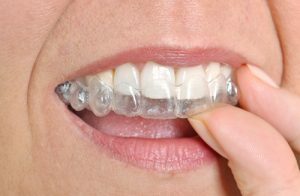 Does Invisalign® improve dental health? During treatment, patients can easily maintain oral hygiene habits for their dental health. By straightening the teeth, Invisalign® promotes better dental health because straight teeth make oral hygiene easier and guard against bacterial buildup and abnormal wear on tooth enamel. How long does it take to see results with Invisalign®? One of the major advantages of Invisalign® is that you will see results throughout the treatment process. You may even see initial results by the time you switch to your second set of alignment trays. How long is treatment with Invisalign®? Invisalign® treatment takes an average of 12 months for adults. This length can vary more significantly for teens. How does Invisalign® move teeth? Invisalign® aligner trays are fitted directly to your teeth and apply a controlled force that causes certain teeth to shift. Your treatment trays are mapped out specifically for your teeth, and you switch to a new set every two weeks or so. Each new set is slightly different from the previous set and pulls your teeth gradually closer into position. How do I take care of my Invisalign® trays? A special Invisalign® cleaning system can be used to clean the trays. Brushing and rinsing them in lukewarm water can also suffice. Brush your teeth after every meal to prevent food residue from staining your trays. Avoid putting the trays in hot water because it can warp the plastic. If your trays warp or crack, contact your dental practitioner right away to get new trays. How often do I have to wear Invisalign®? Invisalign® trays must be worn 20 to 22 hours per day. Who should not use Invisalign®? Patients with baby teeth are not good candidates for Invisalign®. Those with severe issues such as large overbites may need more advanced orthodontic procedures. If you are interested in Invisalign®, your best option is to schedule a consultation to determine if this treatment is right for you. How often do I change my Invisalign® trays? Your dental practitioner will tell you how often you should exchange your trays. On average, you should switch out your Invisalign® trays approximately every two weeks. What happens after treatment is completed? After Invisalign® treatment, you may need to wear a retainer to prevent your teeth from shifting back to their original position. Your dentist will determine whether you need a retainer and how often you should wear it. What if I’ve already had braces? If you have already had braces and your teeth are still properly aligned, you do not need Invisalign®. If your teeth have shifted since you had braces, Invisalign® can re-straighten your teeth. How long do Invisalign® results last? The results of Invisalign® can last indefinitely. With proper use of a retainer, daily oral hygiene, and regular dental visits, you can maintain a straight, beautiful, and healthy smile long term. For more information about Invisalign®, request your consultation with our cosmetic dentist, Dr. Kevin Sands. Call 310.273.0111 or complete our online contact form today. This entry was posted on Monday, July 24th, 2017 at 11:25 pm	and is filed under Invisalign®. You can follow any responses to this entry through the RSS 2.0 feed. Both comments and pings are currently closed.